Mobile device management (MDM) start-up AppTec is releasing a free version of its new Mobile Enterprise Management (EMM) 2013 solution for small and midsized businesses. Up to 25 users can take up the free version, which can be deployed in AppTec's cloud or as an on-premise virtual appliance. The latter has a multi-client architecture, with one version of the software installed for all users. Other features of EMM, which supports iOS and Android, include blacklisting of applications, security encryption and the ability to wipe data on lost devices. Devices can be managed through a web-based console, which features a self-service portal for users, a dashboard for first-level IT support and the ability to change policies through a drag and drop interface. Sanjay Patel, CEO of AppTec distribution partner AiVirtualisation, told TRPro that EMM retails for £20 per user after the the 25 licences are used up. "Companies driving BYOD adoption say cost and complexity are the main factors when choosing a mobile device management solution, so AppTec's simple and cost-effective product is a no brainer for SMBs," he said. "Its multi-tenancy architecture means IT is always in control of the solution too, which can help prevent downtime." Patel said AppTec is bundling a 'bring your own device' security application by Winfrasoft with MME in the coming weeks, which provides pattern-based authentication. "The brain is hardwired to remember patterns, like when people go to the cash point they see a PIN-code pattern, rather than a number," he says. "BYOD security is an issue, and patterns are practically unhackable, so we expect it to be a big push for us." 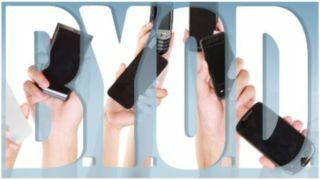 A recent survey by Spiceworks shows that SMBs trail on mobile device management adoption, despite strong awareness of the security risks posed by growing support for BYOD movements.